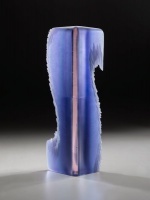 Alex Bernstein grew up in a perfect environment for becoming a glass artist., the Blue Ridge Mountains of North Carolina. 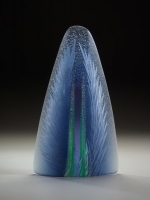 Penland, North Carolina, just minutes from Alex’s childhood home, is home to the Penland School of Crafts and glass artist Alex Bernstein got off to an early start by being exposed to some of the leading glass artists of the 1970’s and 1980’s. His parents, William and Kate Bernstein, are both blown glass artists and a number of other top glass artists such as Harvey Littleton, Mark Peiser and Richard Ritter also lived nearby. Alex began his formal higher education studying psychology at the University of North Carolina in Asheville and worked at a children’s psychiatric hospital before making the decision to purse an art career. 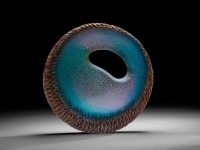 He received his Master of Fine Arts from the Rochester Institute of Technology and went on to teach at that school as well as at the Cleveland Institute of Art, the Corning Glass Museum and the Penland School of Crafts. 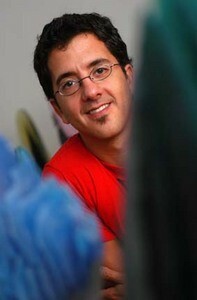 Most recently Alex Bernstein was Department Head at the Worcester Center for Crafts in Massachusetts before moving back to his native North Carolina in 2007 to set up a private studio in Asheville. 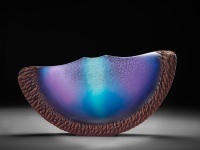 Alex Bernstein has glass sculpture in a number of major private and public collections including the Corning Museum of Art, the Glasmusuem Frauenau in Germany, the Museum of Fine Arts in Bostson and the Palm Springs Art Museum. Alex is now a full-time glass artist. His cast glass art is uniquely his own and rather easy to identify but difficult to classify. 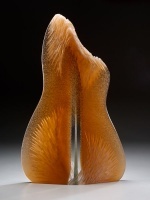 His main technique is cast glass and his forms tend to be organic in nature.